At OLIKA, we wanted to create a product with personality. Birdie is most definitely a “he,” and honored to be called “The world’s most beautiful hand sanitizer,” by Fast Company. 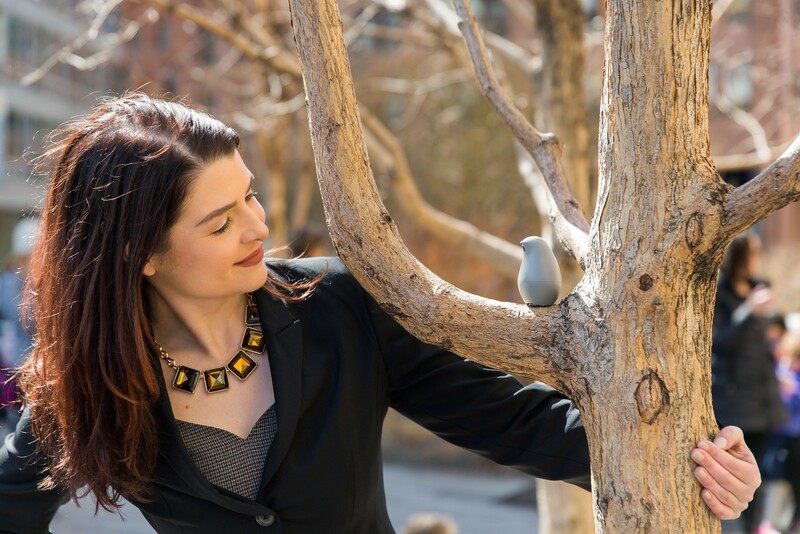 Jessica Postiglione is the CEO & Co-Founder of OLIKA (oo-lee-kah), a startup that created “the world’s most beautiful hand sanitizer,” also known as Birdie. OLIKA is following in the footsteps of brands like Method and EOS that have launched consumer goods that combine delightful packaging with formulations that contain high quality natural ingredients. Hand sanitizer has never looked so good. I was born and raised in Chicago proper, the eldest of five children in a working class household. Due to a very generous financial aid package and scholarship awards, I was able to attend the University of Chicago. After a few years in the workforce, I was accepted to the Harvard Business School. I was the first in my family to enroll in a graduate program. As far back as I can remember, I’ve had a passion for business. At one point in high school I even tried my hand at selling homemade arts and crafts. While my home-based, high school startup didn’t pan out too well, many lessons were learned in the process. After college, I was an investment banker and held a number of corporate strategy roles after business school. I knew I always wanted to do something entrepreneurial, and when given the opportunity, I jumped at the chance to build OLIKA. OLIKA is a design-forward brand reinventing consumer staples, starting with hand sanitizer. Our first product is Birdie, an adorable 2-in-1 hand sanitizer with a natural sanitizing spray and 10 dry wipes housed in his base for additional cleaning. At OLIKA, we wanted to create a product with personality. Birdie is most definitely a “he,” and honored to be called “The world’s most beautiful hand sanitizer,” by Fast Company. He feels good and he is out and about looking for love. Meet him at OLIKAlife.com. I developed, wrote, and appeared in our cheeky brand video series called, Give ’em the Bird. In the first episode, titled “The Dirty Dog Walker,” the male protagonist tries to woo a fellow female dog walker. After exchanging some flirty banter, he casually picks up his dog’s poop with a crumpled-up paper towel, subsequently attempting to use the same hand to greet the woman. Knowing the “devil is in the details,” I wanted to ensure that the dog’s “business” looked as real as possible. Enter Amazon, and countless hours spent searching for “fake dog poop.” I spent perhaps a little too much time pouring over which products seemed the most realistic and had the best reviews. Looking back, I don’t know which is funnier, that part of my job consisted of searching for this item or that Amazon had tons of options. You can be the judge below. Do you think it looks realistic? I always look to set a good example and strive to serve as a role model for others, especially women. Starting a business is hard work and can be quite scary, but it’s also very rewarding. I also hope that our product Birdie brings goodness to the world by 1) doing his job of protecting hands against germs, and 2) bringing more joy to a person’s day. At OLIKA, we like to think our bird elevates an everyday experience to a smile-worthy moment of personal care. The reaction children have to the product is just amazing. The look of excitement and wonder as they hold Birdie in their hands is why we get up in the morning. What are your “5 things I wish someone told me before I launched my startup,” and why? Always have a plan B, C, D, and E ready because plan A rarely works out. Whether it’s due to financial constraints or bandwidth issues—or both—your primary plan won’t always pan out. It’s important to be able to react quickly, remain nimble, and stay flexible. It serves as a huge competitive advantage. Learn, learn, and keep on learning. It’s nearly impossible to prepare yourself for the amount of questions and “homework” you will have as a first-time founder. For example: How do I build a website that is equipped to take orders? How do you collect and record sales tax? What vendor is best to pay employees? How do I manage my social media accounts? I’ve found it helpful to bounce ideas off of other entrepreneurs who have tackled these same challenges as they are pretty universal across industries. Know yourself. It’s important to have a clear idea of your strengths and weaknesses ahead of hiring, as good talent that fits with you and your company can be hard to find. In my experience, you need people in your corner that believe in the brand, believe in your vision, and can bring their unique skill set to the table as well. We’ve had great success connecting with talent on AngelList. The odds are (rarely) in your favor. Not to be a “Debbie Downer,” but realistically, prospective partners will not want to just take a chance on your business. They want to work with businesses that have a proven track record to minimize their downside exposure. For example, quite a few manufacturing partners turned us down at the beginning. Luckily we’ve found others who understood our vision, our potential, and have wanted to partner for the long term. On the flip side, now that we have traction, I am fielding countless inbound cold emails from vendors who suddenly want to partner with us. It’s important to remember who took a chance on you when no one else would. Celebrate the wins! Building a business from scratch is an incredible opportunity and one with many highs and lows. Celebrate the wins because they are well earned, and at times can seem few and far between. The team and I love to “applaud” each other on Basecamp (our project management software) for the little wins throughout the day, and it’s a nice reminder that we are making progress even if some days we don’t know right from left. I would say Miley Cyrus or Jeff Bezos; and that might be the first time ever they were referenced in the same sentence! While hailing from completely different industries, both are risk takers, courageous, and think outside the box. They are examples of what brands need to be to stay relevant and fresh in this ever-charging, on-demand world. Note to our readers: If you appreciated this interview, please click on one of the buttons on the top left to post to your Twitter, Facebook or Pinterest. If 2,000 people like you do this, there is a good chance this article may be featured on the homepage.